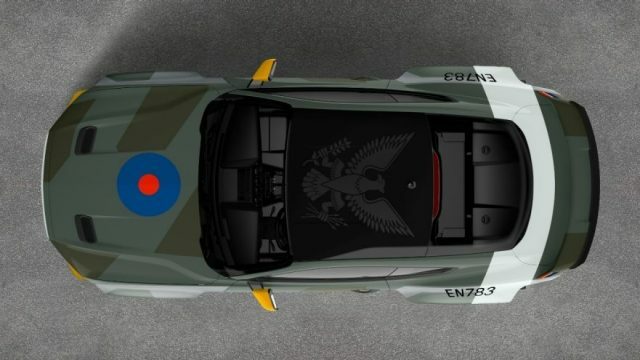 Ford, along with world champion drifter Vaughn Gittin, Jr., salute the American fighter pilots who served in the Royal Air Force during World War II with the Eagle Squadron Mustang GT. This distinct Mustang GT was created exclusively for the Experimental Aircraft Association’s auction to support the EAA’s youth education programs. The auction will take place at The Gathering, the association’s largest fundraiser, on July 26th. This event brings in more than 1,000 aviation fans every year. This is the twentieth year Ford has supported the program. It’s also the eleventh time Ford has created a special edition Mustang for the event. These unique Mustangs have generated over $3 million in funds for the association. The Eagle Squadron Mustang GT features a 700-horsepower 5.0-liter V8 and includes a Ford Performance supercharger, RTR carbon-fiber wide-body kit, and Tactical Performance suspension package. The winning bidder will also receive a package for two to attend the 2018 Ford Windward Dream Cruise this August to receive the keys and a plaque autographed by Gittin and members of the Ford design team. If you want more info on the event or the EAA, call 920-426-6573 or send an email to gathering@EAA.org.